The guy upstairs said, "Listen, I have got a perfect place for you (in Pittsburgh). This is where you should be." Mike Lange does not need an introduction. He is the voice of the Penguins and has been with the organization for almost 40 years. He granted me an interview, and I was fortunate enough to speak with him yesterday on behalf of Pens Initiative. Pens Initiative: How did you get into radio and television broadcasting? Mike Lange: I grew up in the 50's and became somewhat of a sports fan in Sacramento, CA. My dad used to watch the NFL when it first started on television and Friday Night Fights. We would watch that together, and then the San Francisco Giants came into existence. The New York Giants moved to San Francisco, and for some reason that enamored me. I played baseball as a kid. I kind of gravitated to them, and they kind of sparked my interest. I started listening to games, and in those days almost every game was on radio. It became sort of fascination for me, and fortunately for me, I knew that at the age of 9 and had a pretty good idea of what I wanted to do. As far as hockey, that is a whole different story. I didn't really discover that until I was in college at Sacramento State. I was invited to go to an Industrial League game with one of my roommates who worked with the California Golden Seals as an intern. He asked me one day if I was interested in going to see a hockey game, and I told him what the average person would tell him, "I haven't got an idea what a blue line, or a red line, or anything is." He said, "You know Mike, you are trying in this stuff, you never know..." I went and ended up working with him as a helper and working the penalty box. It was on either side of a Zamboni, where I had to let the players out. It was 4 on 4 hockey. They had crowds at this place. It was a small, semi-pro type of league. The fascinating part really was during the game they had the PA announcer - he was a little Canadian guy - actually calling the game play-by-play as it went on in the building. Long story short, at the end of that year, everybody thanked everybody and the next year they asked me if I wanted to come back, and I said I would give it a go with aspirations of doing their playoff games for our college radio station. We had a good advisor who was pretty good with us, and we were allowed to do baseball, basketball, and football for the school. That was a good experience. The guy that came back to do the play-by-play, unbeknownst to me, was talking to these people. He got paid $5 a game, and he told them he wanted $10. They said, "We can't pay you $10. We don't have $10." He told them, "I'm out of here." They asked me if I wanted to do it, and at that time I could get a big pizza and a pitcher of beer all for less than $5. I said, "Sign me up!" So that's what I did. I did the play-by-play in the building, and then at the end of the year I did the playoffs and radio. I kept those tapes and that's where it led from there as far as doing hockey and learning the game of hockey. It's a different story, but it's a true one. I never would have thought I was going to be in hockey, to be honest with you. My love was baseball, football, and basketball because I never really grew up with it. When I ended up getting a job finally in Phoenix, I made it a point to study and learn. I don't know why, but here it is. Many years later and I am still doing hockey. It's an unusual trip and road to get there, but it's one I think was determined before I even knew what was going to happen. Fate has a lot to do with your life. PI: You have been with the Penguins through some rough times - bankruptcy and threats of relocation - what has kept you with them for almost 40 years? Mike Lange: I think the uniqueness of the city, the people, and maybe the comfort level. Just to back it up a little bit. When I went into work, I ended up first in Phoenix, and I was there for two and half years. What I was trying to do was angle my way back to California, and the chance came up to go to San Diego. I was in the old Western Hockey League then. It was a pretty good league - San Diego, Phoenix, Seattle, Portland, Denver, and Salt Lake. When I was working minor league, we were traveling by air everywhere. It wasn't the bus routine. It was a good league. I got to San Diego and I said, "You are going to do it. You are going to get to San Diego. You are going to get your feet wet with hockey and then baseball." I was a big baseball fan, and I was hoping with the Padres there that eventually down the road I would do both. I would be right where I want to be for the rest of my life. The year I went to San Diego the league ended up folding. That was not of bankruptcy, but of the league folding. I had to scramble to find a job. Fortunately for me it ended up I had an opportunity to apply in Pittsburgh, and that's actually how I ended up in Pittsburgh. I didn't think I'd be there more than one year or two because I still had aspirations for what we just talked about. Something talked me out of it. The club went through two bankruptcies. One in 1975 and then the second one that Mario came out of. Most people don't remember that, but we all lost our jobs after one year there. I was certainly aware of the fortunes of business in broadcasting because in a span of two years I was whacked two times. I ended up going back to California for one year, and then I had the opportunity to come back. I thought I had the Pirates' job, but I ended up getting the Penguins' job again because the gentleman brought me in to the games. That's the roundabout way to say that is when I came back. I like Pittsburgh. I met my wife, who worked for the Penguins at the time there, and it just kind of grew from there. I came to the right place. The history of Pittsburgh is Rosey Rowswell, Bob Prince, Myron Cope, and me like a crazy man, I was just a normal person to them. I didn't do anything all that different. You are expected to be somebody that's got something to offer. It just fit perfectly for me. I go back to my fate premise, but I think that is when the guy upstairs said, "Listen, I have got a perfect place for you. This is where you should be." Mike Lange: It really is, and even more so because my family is a five generation Californian. They came in the gold rush days - my grandfathers - and all those people that put foot in California. They are all still there. I am the only one that took the covered wagon and went the other way. That in itself is a difference to what the normal person would experience. That made it even more intriguing. The whole atmosphere surprised me how friendly and how great the people were. All the things that it had to offer that were different from when I grew up. I liked it. It just kind of grew and got a little better I worked with the team and the object was to get interest and try to create interest for it and it started to build. Lo and behold, here comes Mario on the scene with a big wide horse. That even added more. It was a great experience. PI: You talked briefly about Myron Cope and Bob Prince. You are going to be forever remembered with those two and beloved in Pittsburgh; what does the city and fan base mean to you? Mike Lange: When you are doing things and you’re with those types of people, you are in the same generation. Well, they were a little bit further behind me, but we just do what we do. It is not by design to follow anybody. At least it wasn't for me. I guess time is probably your greatest friend for doing games over a number of years. If either one of them were alive, they would probably tell you the same thing. I am not quite sure why people recognize that, but I do think people get familiar with a voice. They get familiar with people, and like I said, I get familiar with them too. I know how they work, and what they respond to It is just a comfort thing and you just know it kind of fits. I can't explain it, and I don't think they could either. If you had the chance to talk to them, it would probably be the same thing. Bob Prince and I became very close in a very short period of time when I first came to town. He taught me a lot of things. I asked him about the city and what to do, and he was dead on with things he talked about. I just took that advice and ran with it because I am in his market. I am in his place. It helped my immensely. Myron, I didn't know him as closely as Prince, although I knew him for more years. Myron was Myron. Myron would tell you a lot of what he does was just the way he was, and somehow it struck a nerve with the Pittsburgh people. Anybody that heard him outside of the city in the broadcast field or anything like that just say, "Ahhh...(Myron Cope voice)." But after two weeks or three weeks of listening to it, you realized really just how knowledgeable he was. To me, maybe one of the best journalists I have ever met in my life was Myron Cope. He would decipher. He was fair. He never responded quickly to things like most people do. From a journalist standpoint, he was a top-rate pro. He just happened to have his voice, and then he learned how to work with that too, to make it work him. That tells you the brilliance of what Cope brought to the table and the legacy he left in the city of Pittsburgh. Prince was the same way. They just had that. I don't consider myself anywhere near their categories and I was around them. So, to be thought of in any way like that is pretty inspiring to me and appreciative on my end. PI: You spoke briefly about your humble beginnings. In 2001 you won the Foster Hewitt Memorial Award for NHL broadcasting excellence and were subsequently entered into the NHL Hockey Hall of Fame. Can you describe what that meant to you? Mike Lange: I was more thrilled with the fact I was able to do that from the standpoint there weren't a whole lot of Californians. To this day, I am not sure there is another one in the hockey hall of fame. I don't know that for a fact, but that meant more to me with the sport and the growing of the sport probably than anything else. To me it is like, here's a guy that really didn't see a game until he was 20. He got involved in it and dedicated himself to try to learn the game and convey it to people. I was able to fortunately be honored by the people I work with and those are the best. That is significant. You really appreciate it from the world of hockey and all around. From where I came from and my history of the game, as limited as it is...with most all of those other guys in the hall of fame, it made it pretty special to me. That was a major accomplishment and one I cherish even to this day a whole bunch. PI: You have called and seen a number of great moments through Penguins' history. Is there one play, goal, or save that stands out to you? Mike Lange: I think we did everything simulcast at that time in '93. You can build a story, and that is part of the beauty of it. Whether it is a plus or minus, you can build that story all the way up until the very end, and that is an exciting thing to do. Since I am back on it, radio affords that opportunity as much as any because you are building that from word description...you actually are. You are writing a small book during every game, and every game is different. That is kind of the beauty of it. There are some real stinkers. There are some that aren't too good with the way they are played by both teams, but there are those moments where the book kind of falls into place. You get your beginning, middle, and you can get that feel after doing it so long to kind of build it up to be what you hope is going to be a pretty good finale one way or the other. PI: You are known for your catch phrases. Do you feel like those kind of add to the story you are talking about and give people that visual depiction you are talking about when they are listening on the radio and can't see it on TV? Mike Lange: You know even on television they were responsive to it. I think people need or like something to connect to, and that was kind of a bridge for me to have them connect. I can only go back when I was listening on the radio when I was a kid and listening to a gentleman named Bill King who used only one phrase in his description of games, and he was maybe one of the best all-time as a broadcaster. He would just say, "Holy Toledo!" Every time he did it brought that tingle down my whole body, and I just said to myself, "If I ever get into this business, if I am ever allowed to that, I am going to have my own. I am going to be able to create and do some things." Well, lo and behold, I go to Pittsburgh and it just kind of goes crazy. People start sending me things and stopping you and adding. Then we started adding ones I take under consideration and it kind of grew. It became a part of me. I don't think they do it now because they don't see me on the television side or hear me, but there was a time they used to have pools at the bars where they would have the phrases and people would buy-in to see which phrase was going to be used on the first goal. So, they were doing a lot of that and getting free drinks, and so it became a fun time for everybody and to me that is what you want to do. For me, our seasons are too damn long not to have some fun with what you do, and I have always kept that premise and worked with it. Even the players enjoy it at times, other people do, just to have a little difference in approach to how you call a game. PI: When new players like Sidney Crosby or Evgeni Malkin came to Pittsburgh, you developed some new phrases for them with "Slap me silly, Sidney" and "Make me a milkshake, Malkin." Are they from other people? Did you create those? Mike Lange: Slap me silly is a phrase my father used years and years ago. I don't know why I thought of it, but all of a sudden with the 's' there it kind of fit to me. So I said I'll give this a shot, and that's where that came from. I did an interview with a young kid, who was a Trib reporter - you know in between periods they interview a couple of the players. So after I interviewed with him, we were talking and at the end of it, I said, "Dylan, do you have any phrases that you can give me?" He stepped right up there man and went right to the plate and said, "Make me a milkshake, Malkin." And he stopped me. I mean there has only been a couple of times where somebody has said something or written it down where I knew immediately it was going to work, and I knew it would work. That young man is pretty proud of himself, but I am pretty proud that he gave me something that was a strong as that. There are places that make the Malkin milkshake, so I know it had some influence somewhere. So, mostly they come from situations. PI: Do you have a favorite time or era in Penguins' hockey? I know you talk a lot about when Mario and Jagr were there, and there was obviously the excitement in the early 90's. Then there was the bankruptcy in the late 90's and the talk of relocation to Kansas City in the mid 2000's, and so it has seemed pretty special what has happened with this newer generation too. Is there one that was more exciting for you or are they each special in their own way? Mike Lange: Not really. I think people are basically the same. We just all have our generation where it comes up. I am fortunate to experience all three of the Stanley Cup runs, so I am a blessed few. I did a speech the other night at Penn State up in Erie, and I was up there and talking. I looked in the crowd and saw these young people and everything and I was standing up there and you take it for granted where you are in your life. I was looking out at the crowd, and I am sure not a one of them had the experience and probably not you either of John F. Kennedy's assassination...the man on the moon. They weren't alive. I started thinking back. My era is back after World War II. I was always fascinated about what really went on in World War II. Everybody has their era and their time, and it is special to them. As you get older, it is still pretty special to you. It still means a lot, but quite honestly, I think everybody in the history of going back...your first cup win certainly is something that will never be forgotten. Especially for the city. I think the same thing can be said for the Steelers. None of us were around when the Pirates won their first World Series, but every one still is pretty special. The last one was in '79, and I was here for that one. All of the Steelers' Super Bowls. All of the Stanley Cups, so I have been pretty blessed to do it, and it keeps you young. It keeps that interest up for the younger generation and supports their enthusiasm. I mean it is contagious. I still have it, but I am older than the players are now. At one time, believe it or not, I was the same age, if not younger. It is just something you want to convey to people, and you see them gravitate to it. It is a warm feeling. It is a great feeling to see them kind of latch on to their generation of stars and players and see it develop. That is pretty special. It is great, and I have had at least one generation of kids listening to me whose kids now listen even today. I have been told that a number of times. That is pretty good that you are able to have that kind of enthusiasm still as you go along for all of the games you have been able to do. Mike Lange: They are and that is the difference. Even looking at Jaromir Jagr. I hope Penguins' fans and people in hockey won't under appreciate how great of player Jaromir Jagr was, and he is still playing. But he also will tell you right up front that he learned a lot about how he plays the game from 66. He is a great student of the game is Jagr. Lemieux, that is just the unabridged, natural ability that Lemieux had as a hockey player. Couple that with the fact that he was 6'4", and in those days, that was a big man, with the skills and the touch of an angel with his hands. The best pure goal-scorer I have ever seen. The best pure passer. He just stands out head and shoulders to me at this moment as the best player that we have seen, but it is not to say Sidney Crosby won't be because it is still early in his career. However, he is now nine years into his career, but it is a different game. The game was a little more wide open when Mario played from an offensive standpoint, and I wish Sidney could have played in that era. He would have been unbelievable. I don't say that he is not now because he is. He is just an incredible talent, but he'll reach his level. We will find out if he is in that category. There are just a very few who are in Mario's, and it is not to take anything away from Sid. I am not sure if he is going to accomplish that, but he very well may be able to do it. He is blessed with the talent. I don't think it is quite as natural as what Mario had. Mario just showed up. The way he was able to handle the puck and everything that he did. Sid is, I don't want to say the opposite, but Sid is a tenacious worker of learning and repetitive and working, working, working. That is the strong point of his game. I think if you put Sid's work ethic in Mario at a young age, wow. I mean get out of dodge. You had that with Gretzky. Gretzky was that type of player, and that is why Gretzky boasted all of the numbers that he did. He just was relentless. Mario is in the hall of fame. Sid will be there. There is no question. Has he reached the Mario Lemieux status at this point? I don't know if it is quite appropriate enough to say that as far as him being that type of player. I don't think we are too far away from him being a certain hall of fame entry player. That is just a matter of time. I mean that is how good of a player he is. PI: The last question I had for you is that you have been doing this a long time, and you mentioned that too. What does the immediate future hold for you? How much longer do you see yourself in broadcasting? 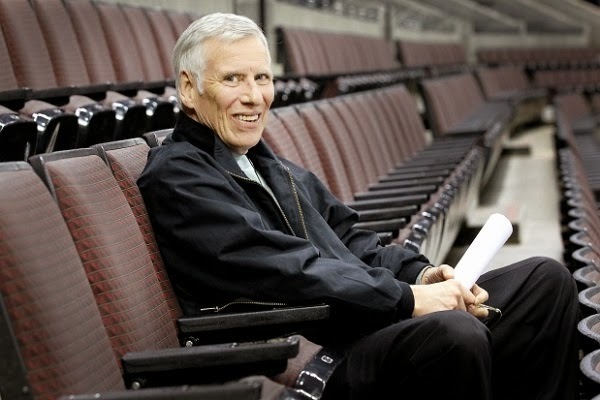 Mike Lange: Well, if I can get another 35 years, I'll probably be OK. I'll leave you with this story, and I am not sure where it is going to go, but the man I talked about working with in Phoenix for my first professional job in hockey was a dear gentleman, and his name was Al McCoy. He taught me everything about radio. He taught me about broadcasting. He taught me as a person how to handle things. How to be around players. He was an unbelievable person. And guess what? He is the longest tenured broadcaster in the NBA right now. He is 80 years old and he is still doing the Phoenix Suns. He is still as good as ever. So, I don't know, and he obviously doesn't know either. He is still doing games. I'll do it until I decide to either try something different, or I just decide that will be the end of it. I don't have an answer for you. Right now I am having fun, and when I have fun...how many people can say they do something they love to do for a living and be able to convey it to people and keep that situation going? It is something you think about along the way, but it is also something you know how enjoyable it is. I can't give you a definitive answer, but I'll just say that Al is 80 and still going strong. We'll see. "Keep smilin' like a butcher's dog. That's all I need you to do...everyday. You'll have bad days - think of the dog. If it really gets bad, think of the dog in the car when you buy Sam a drink and get his dog one too."